This past Spring, our beautiful city welcomed back one of the only Canadian family-run hotel chains, Groupe Germain. Joining its sister brand that opened in 2016, Le Germain Hotel Ottawa is integrated into a state-of-the-art, mixed-use building that is part of the Ottawa Art Gallery Expansion and Courts Redevelopment. The complex also includes the ArtHaus private residences. As with any luxury hotel, there is always a food and beverage component that comes along with it. In this case, it saw the creation of what I consider, the coolest and most innovative hotel restaurant I’ve ever experienced. NORCA Restaurant & Bar features NORthern cuisine and CAnadian ingredients – using fruits, vegetables and proteins exclusively from Canada. It offers an amazing year-round menu that aims to bring locals and travellers together in an enveloping environment and takes them on an adventure through a lively, evolving and truly gourmet menu. At the helm of this amazing restaurant is Chef Dominique Dufour. She is an inspiring young Chef that grew up in the eastern section of Montréal and had a passion for food from a young age. Her culinary journey began while working in a supermarket bakery at the age of 15. Having moved out to Vancouver when she was 20, she worked at the Carthage Café and the Opus Hotel. After the 2010 Olympics, the industry slowed down so Dominique moved to Toronto and studied Culinary Arts at George Brown College. 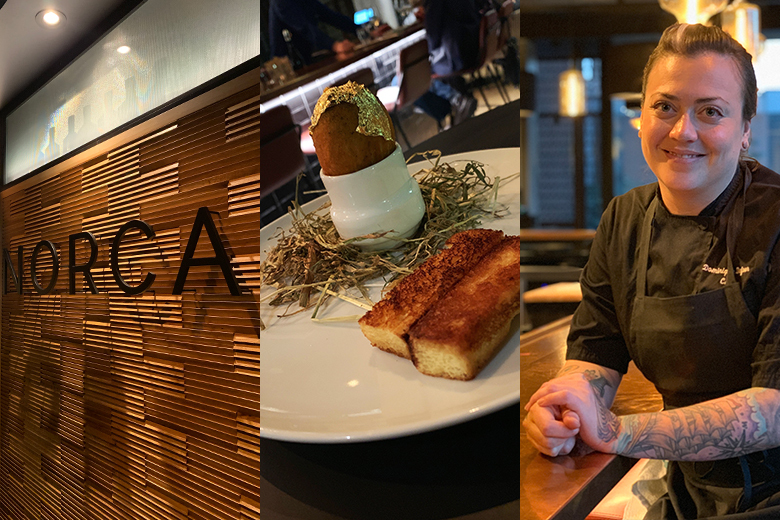 After a stint in vegan restaurants which included Grasslands, she joined the Icon Legacy Hospitality group and worked at both Patria and Byblos. In 2015, Dominique moved to the Yukon, to pursue her desire to get closer to the producers and food. This ignited her interest in defining Canadian Gastronomy. In 2017, she moved back to Montréal where she worked at Ludger and Magdalena. With 13 years of professional experience under her belt, she honed her skills and passion for Canadian cuisine. Taking the lead and helping create NORCA made so much sense. Their year-round menu is one I could easily write amazing things about but this month, Chef created a truly Canadian tasting menu like none I have ever experienced. The sampling of innovative creations showcase Dominique’s culinary journey across our beautiful country. As I don’t want to ruin the experience for you, I won’t go too in-depth however, check out this amazing menu. The menu is accompanied by a “book” that tells a little story behind each one of the courses and was written by Dominique. Read the page, eat the dish, repeat. The menu also offers interactive serving, plating and sometimes even requires eating with your hands. There is no doubt in my mind that this is an award-winning dining experience. It is clear to me that Chef Dominique Dufour should compete at Canada’s Kitchen Party – Ottawa next year. If you’re in Ottawa, you need to experience this now. If you aren’t, plan your trip to Ottawa soon to experience this phenomenal tasting menu. Dominique has defined Canadian Gastronomy – well done Chef!